Andy Halliday became the second Rangers player to see red on Sunday afternoon after he was shown a red card over a post-match melee. The pushing match started when Halliday confronted Celtic captain Scott Brown following the home side’s 2-1 victory at Celtic Park. Halliday wasn’t happy with Brown celebrating towards the Rangers fans and let him know about it. Several players from both sides became embroiled in the spat with Brown being pulled away by team-mates. After it settled down, Halliday was shown a second yellow card by referee Bobby Madden. This topped off a frustrating day for the visitors who managed to haul themselves level despite going a goal down and seeing Alfredo Morelos sent off during the first half. Ryan Kent equalised on 63 minutes to set up the grandstand finish. 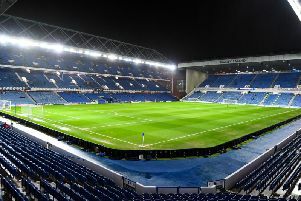 The away side threatened to take all three points, especially after an injury to Dedryck Boyata reduced Celtic to ten men also, as the hosts had used up all their subs. But a mistake from James Tavernier allowed Celtic to launch an attack. They finished it when Edouard found James Forrest streaking into the box and he passed his finish beyond Allan McGregor for all three points.